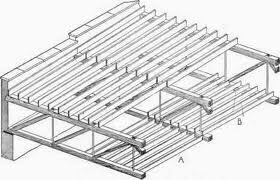 The structural design of a flat roof is similar to that of a floor, utilizing joists and girders. However, a flat roof is typically the most problematic because of drainage and snow loading. A flat roof with a parapet wall tends to impound water, so that when one or more area drains is clogged, standing water sits on the roof. This is problematic both due to the live load and to the potential to develop leaks. Snow loads may accumulate in excess of those prescribed by code. Therefore, while maintenance of a flat roof is critical, there may also be good reason to design or reinforce a roof to exceed code requirements.